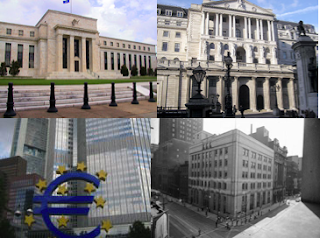 Aside from issuing the nation's currency, formulating monetary policy and implementing it though interest rate measures and managing the money supply, a central bank is also a regulator of the nation's banking system, and as such it can set the discount rate, the interest rate charged to commercial banks and other depository institutions on loans they receive, in the case of the United States, from their regional Federal Reserve Bank's lending facility - the discount window. The Federal Reserve banks offer three discount window programs to depository institutions: primary credit, secondary credit, and seasonal credit, each with its own interest rate. All discount window loans are fully secured. A central bank also acts as a lender of last resort to commercial banks and other financial institutions and even non-financial corporations during periods of systemic financial stress. It aims at applying a monetary policy that will stabilize the credit and money markets by providing needed liquidity to the banking system and the credit markets in times of systemic financial distress. To add liquidity to the gold market, many central banks provide gold to bullion banks and commercial banks with proprietary gold trading desks. According to the World Gold Council, bullion banks are investment banks that function as wholesale suppliers dealing in large quantities of gold. All bullion banks are members of the London Bullion Market Association. Bullion banks differ from depositories in that bullion banks handle transactions in gold and the depositories store and protect the actual bullion. For example, the Federal Reserve Bank of New York stores and protects gold for a number of central banks and foreign governments. The US Bullion Depository in Fort Knox, Kentucky houses most of the gold bullion belonging to the United States. Significantly, central banks choose to release gold to market participating institutions by leasing out gold for fees denominated in dollars instead of selling gold outright for dollars. This is because central bankers know from experience in recent decades that fiat currencies, led by the US dollar, had been repeatedly devalued against gold by deliberate Federal Reserve policy. This policy-induced debasement of fiat currency by central banks can be expected to continue well into the foreseeable future until market confidence in fiat currencies is exhausted, and a new international finance architecture is formulated. Before that final crisis happens, central bankers would look for another white knight in the form of a reincarnated Paul Volcker to slay the inflation dragon with another blood-letting cure of sky-high short-term interest rates, as he did in the 1980s. However, within the pattern of protracted steady decline in the purchasing power of fiat currencies over the long run, the price of gold can be highly volatile at any one time for a range of obscure reasons. Peaking at $850 per troy ounce on January 21, 1980, gold fell to $285 in February 1985 and recovered to reach $800 in November 1987, all within a period of seven years. Having failed to overtake its historical peak price for the second seven-year period, gold fell back down to $357 in July 1989. It rose to a high of $417 seven years later in February 1996, only to fall back to $250 in July 1999. Gold was $35 cheaper per ounce in 1999 that it was on 1985, 14 years before, and $35 was the price set for an troy ounce of gold at Bretton Woods. Notwithstanding common perception, the above indicates that gold is not a totally reliable store of value even for the long run. The price of gold had been and still can be detached from general inflation rate in the global economy for extended periods. For example, from its peak of $850 per troy ounce set in January 1980, the gold price was falling towards the end of the same year when economic data and central bank policy would suggest that it should be rising, with US inflation rate reaching 14.5%, bank prime rate at 20.5% as a result of Fed chairman Volcker setting the Fed funds rate at 20% by December 1980, with the unemployment rate at 10.8%, and 30-year fixed rate mortgage at 18.5%. In 2008, the gold price kept rising when economic data would suggest that it should be falling, with the US inflation rate falling from 5.6% abruptly to 1.07% by November, and the bank prime rate fell to 3.5% while the Fed funds rate was lowered to 0-0.25% in December, with unemployment at 10.7% and 30-year fixed rate mortgage at 6%. These figures were clear signs of a severe liquidity trap, which John Maynard Keynes defined as a drastic fall in market confidence giving rise to a liquidity preference that overrides otherwise normal stimulus effects of low interest rates on the economy. The peak gold price of $850 per troy ounce set in January 1980 was not breached for 28 years, an extraordinary long period for a bear market for gold. It fell to a historical low of $250 in July 1999 while inflation was rampant, after which gold took off to reach a historical high of $1,421 on November 9, 2010, an extraordinary rise of 569% in just 11 years, in a period of general deflation. The volatile gold price pattern in the past three decades obviously was driven by more than market supply and demand for the precious metal, or by the persistent debasement of fiat currency. In fact, central bankers know that central bank monetary policies and continuing central bank intervention in the gold market had much to do with this wide volatility in the price of gold. A secondary reason why central banks lease out gold is to earn interest and to capture arbitrage profit from the differential between the dollar interest rate and the gold lease rate. Central banks do this to lower the carrying cost in a contangoed forward price curve, while at the same time capturing anticipated gains in gold price. Contango depicts a pricing situation in which futures prices get progressively higher as maturities get progressively longer, creating negative spreads as contracts go further out in time. The time-related price increases reflect carrying costs, including storage, financing and insurance. Contango is a term used in the futures market to describe an upward sloping forward curve (as in the normal yield curve). Such a upward sloping forward curve is said to be "in contango" (or sometimes "contangoed"). Formally, it is the situation where, and the amount by which the price of a commodity for future delivery is higher than the spot price, or a farther future delivery price higher than a nearer future delivery. Focusing on gold leasing fees is a diversion from the fundamental reason why central banks lease out gold. Central bankers know from experience that even as the price of gold rises, the monetary profit gold owners make from holding gold does not necessarily add up to net gains after inflation. Gold owners are merely hedging to reduce, but not avoid fully, monetary losses from the inevitable debasement of fiat currencies caused by escalating loose central bank monetary policies. Gold leasing does allow central banks to earn rental income with the gold they hold to cover some holding expenses. But more importantly, gold leasing by central banks provides gold-backed liquidity to gold-related financial markets. In a fundamental manner, adding gold liquidity slows the rise in the price of gold which in effects slows the debasement of fiat currencies caused by deliberate central bank monetary easing policies. When a government issues fiat money that is legal tender for payment of taxes (the publics debt to the government) and private debts, it is in essence issuing interest-free sovereign credit to the bearer of its currency, which is "legal tender for all debts, public and private" - a declaration that appears on all US dollar bills - which are Federal Reserve notes. Tax liabilities until paid to the government are debts to the government owed by members of the public within its jurisdiction. The government charges no interest for its sovereign credit in the form of fiat money it issues, unless new fiat money is issued to quantitatively increase the existing money supply to reduce through inflation the purchasing power of the money in circulation. Thus mild inflation, up to 3% annually, is a benign way the government charges interest for holding its fiat money in the form of sovereign credit certificates. In that sense, the mild debasement of fiat money orchestrated by the central bank is an inherent structural characteristic of sovereign credit. In addition to other positive economic effects, mild inflation increases tax revenue from fixed progressive tax rates, through bracket creep. Milton Friedman's monetarist conclusion that a steady expansion of the money supply at 3% annual rate is the optimum rate that balances inflation and economic growth is a confirmation of this fact. The issuing of fiat money as sovereign credit certificates should not be confused with government fiscal spending of fiat money already in circulation in the form of sovereign credit certificates already issued. Only the Federal Reserve, as a central bank, can issue fiat money. The dollar is a Federal Reserve note, not a bank note. The word "bank" does not appear in any dollar bill. The US Treasury cannot and does not issue money. It receives money by way tax revenue denominated in dollars issued by the Federal Reserve. Fiat money in the form of sovereign credit certificates issued by the central bank is accepted by members of the public because, by law, fiat money can be used by the bearer to discharge tax liabilities to government. Payment of taxes with fiat currency is in essence the canceling of tax liability with sovereign credit earned by the taxpayer. The debasement of fiat currency is caused by central bank new issuance, but not by government deficits if such deficits are repaid with higher future tax revenue in the form of sovereign credit certificates (fiat money issued by the central bank) already in circulation. Fiscal deficits are only inflationary if a government pays for them with newly issued fiat money from the central that enlarges the money supply without expanding the economy. In the United States, central banking was not born until 1913 with the establishment of the Federal Reserve System. The first national bank in the US was the Bank of the United States (BUS), founded in 1791 and operated for 20 years, until 1811. A second Bank of the United States (BUS2) was founded in 1816 and operated also for 20 years until 1836. The first national bank, modeled after British experience, was established by Federalists as part of a nation-building system proposed by Alexander Hamilton, the first secretary of the Treasury, who realized that the new nation could not grow and prosper without a sound financial system anchored by a national bank. Jefferson's opposition to the establishment of a national bank was key to his overall opposition to the entire Hamiltonian program of strong central government and elite financial leadership. Jefferson felt that a national bank would give excessive power over the national economy and unfair opportunities for large certain profits to a small group of elite private investors mostly from the New England states. The constitutionality of the bank invoked the dispute between Jefferson's "strict construction" of the words of the constitution and Hamilton's doctrine of "implied power" of the federal government. Hamilton's idea of national credit was not merely to favor the rich, albeit that it did so in practice, but to protect the infant industries in a young nation by opposing Adam Smith's laissez-faire doctrine promoted by advocates of 19th-century British globalization for the advancement of British national interests. This is why Hamilton's program is an apt model for all young economies finally emerging from the yoke of Western imperialism two centuries later, and in particular for opposing US neo-liberal globalization of past decades. The creation of a national bank was one of the three measures of the Hamiltonian program to strengthen the new nation through a strong federal government, the others being (2) an excise duty on whiskey to extend federal authority to the back country of the vast nation and to compel rural settlers to engage in productive enterprise by making subsistence farming uneconomic; and (3) federal aid to manufacturing through protective tariff and direct subsidies. To Hamilton, a central government without sovereign financial power, which had to rely on private banks to finance national programs approved by a democratically elected congress, would be truly undemocratic and to rely on foreign banks to finance national programs would be unpatriotic, if not treasonous. ☮ La Nouvelle Économie Globale. - L'Évolution. Avoid Chaos Now, Participate and Replace the Old Feudal Order by a fair, prosperous and peaceful order.